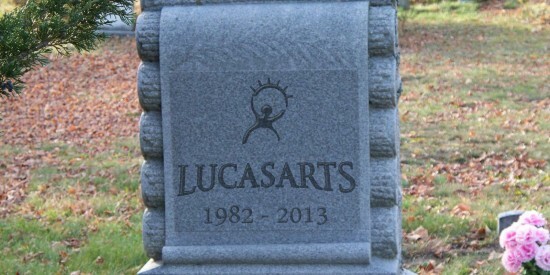 Yesterday morning, the news broke the news that Disney would be shutting down LucasArts, which they got as a part of their acquisition of the Star Wars purchase last October for $4.05 Billion dollars. Back when the sale took place, LucasArts immediately put a freeze on all hiring and announcements. There were also reports that both Star Wars: First Assault and Star Wars 1313 would be canceled with the closure of the studio. It is estimated that about 150 people would be affected by the layoffs. “After evaluating our position in the games market, we’ve decided to shift LucasArts from an internal development to a licensing model, minimizing the company’s risk while achieving a broader portfolio of quality Star Wars games. One of the very first booths I hit on the show floor this year was Bioware’s SWTOR – or Star Wars: The Old Republic – the company’s massively multi-player game set in the Star Wars universe. In development for the last five years, I was excited to learn there would finally be hands-on demos of the game both at the Con as well as off-site at the Hilton Gaslamp across the street. To coincide with Comic-Con this year, Bioware announced pre-orders for the game on Thursday, which would allow players early access to the game as well as spiffy in-game bonuses. Given that the game’s release window is set for Holidays 2011, it made sense for the SWTOR team to leverage Comic-Con to start showing off their shiny new MMORPG. After a roughly 45-minute wait, myself and a dozen other eager players were ushered into the booth and each seated at one of the high-end Alienware gaming rigs running SWTOR. We slipped on our headphones and were given 15-minutes on the clock to put the game through its paces. I decided to play a Sith Warrior, went through a brief intro and my character was jumped into a desert-like world ripe for the exploring. The Flickcast’s very own Cortney Zamm has been covering the amazing video game previews and news hot from the show floor at PAX East 2011 like nobody’s business. And yet, there is one game in particular that I felt deserved a bit of extra coverage. That game is BioWare’s Star Wars: The Old Republic, a story-driven MMO developed in conjunction with LucasArts. There’s a whole lot of anticipation for this game and with good reason: SWTOR will be the WoW of the Star Wars Universe. And the story will be deeper and more personal to each character. If you’re familiar with BioWare’s previous titles, you know how important story is to their game developers. I’ve been following the developer’s blogs and various updates on this soon-to-be released title and recently, I was excited to hear that Bioware made a big showing at PAX East 2011 in Boston, offering fans a few new glimpses at this ambitious project. Be sure to hit the jump to watch the developer’s walk-through video showcasing some of SWTOR’s flash-points with tons of developer commentary and some amazing in-game footage. Last year, we took a more traditional approach with our Best Video Games of 2009 article with categories such as Best Music Game or Best Action Platformer. This year we are going to depart from the traditional and give what we think are categories that truly deserve to be rewarded their due. The ultimate “What If” scenario brought forth to one of the best games of 2010, “What if the undead invaded the old west?” And the answer doesn’t just involve a lot of people dying. There are horses of the apocalypse, big foot, some hard choices to be made and people turning on or abandoning their fellow man left and right. This awesome story told over the revamped look of Red Dead Redemption using characters players have already grown to know, love or despise makes Undead Nightmare not only the best zombie game of 2010 but also the best exmple of DLC for the entire year as well. The San Diego Comic-Con panel for the upcoming LucasArts sequel to The Force Unleashed opened with some amazing cinematic footage from the game. In the footage previewed to Comic-Con attendees, Vader reveals to Starkiller that he is in fact a clone, produced to Vader’s exact specifications and designed to be the perfect apprentice. But the news goes from bad to worse, as Vader explains that he is actually a failed clone. Prone to strange and distracting flashbacks and weird memory-holes, Vader declares Starkiller useless and orders him killed. Starkiller of course, has other plans. Using his incredibly powerful force abilities, he breaks free of his bonds, destroys his Stormtrooper captors and proceeds to flee the planet Camino, becoming a fugitive in the process. The footage from Force Unleashed 2 really set the tone for the big Lucasarts panel revolving around the upcoming sequel to one of the best Star Wars game properties in recent history. A second clip shown at the start of the panel, begins to reveal the back-story to this sequel, showing Starkiller on the run from Vader now, taking his ship and heading for a nearby planet to rescue his friend General Rahm Kota. ‘Unleashed 2’ is revealed to possess a very rich storyline with deep character development as we follow Starkiller on his journey to be reunited with his one true love, Captain Juno Eclipse. Hit the jump for a preview of the gameplay, some of the new force powers available in the sequel, as well as a very special Comic-Con exclusive reveal of a small, but pivotal character who will appear in the new game. Star Wars: The Force Unleashed came to a pretty definitive conclusion (depending on the path you chose at the end of the game). No one knew exactly how the game would be able to have a sequel, especially since Starkiller never appears or is mentioned in the events of Star Wars which followed this game. Star Wars: The Force Unleashed II may have been the one instance where the cloning on Kamino actually paid off as it has given another opportunity to play as this rouge Sith. After being condemned by his former mentor, Starkiller escapes a detention block by ripping his way through Stormtroopers and droids alike. The series has taken a notably more brutal turn as Stormtroopers don’t just fall down after being hit by a lightsaber. They are actually ripped to pieces. It will be interesting to see if this carries over to gameplay or if it will just be used in the game’s cinematics. As seen in the original Star Wars: The Force Unleashed, droids and objects in the environment were often split to pieces. There is certainly a chance they could do the same with people in this game. The force powers also look to have been given a violent upgrade as one looks like it literally vaporizes enemies. Stick close to the Flickcast for more trailers and news from E3 and check out the new “Betrayal” trailer after the jump. One of my personal faves in the ‘Upcoming PC and Mac Games We’re Dying to Play’ category, is Bioware’s upcoming ‘Star Wars: The Old Republic.’ The game known as ‘SWTOR’ to it’s eagerly-anticipating gamer fans, is a story-driven massively-multiplayer online game from BioWare and LucasArts. Explore an age thousands of years before the rise of Darth Vader when war between the Old Republic and the Sith Empire divides the galaxy. With the ability to align yourself with the light or dark side of the force, you will be able to play some iconic Star Wars classes such as Trooper, Smuggler, Jedi Knight or Jedi Consular. Those drawn to the dark side can choose from a variety of classes as well, including the Bounty Hunter, Sith Warrior, Imperial Agent or Sith Inquisitor. Expect the ability to finely-tune your character’s class with a huge list of abilities and skills, so if you want to play a Sith Warrior that can rush into the fray and take a beating, your skills and ability choices will allow you to pull that off. Hit the jump for more details on SWTOR character companions, the MMO aspects of the game, as well as a very special cinematic trailer released during E3 that will blow your socks off! Like we reported back at E3, Star Wars: The Old Republic is making its way to PCs in hopes of doing two things. The first is erase the sour taste that was left in the mouths of players from Star Wars: Galaxies, the first attempt of making a Star Wars MMORPG. In addition to getting rid of that sour taste by establishing a new Star Wars online experience, it looks to take the fight head on to the dark Sith lord that has dominated the online gaming world for the last four years, World of Warcraft. No longer calling itself an RPG, Star Wars: The Old Republic considers itself a Massive Multiplayer Online game with action and roleplaying elements. Even with Blizzard’s response of a new expansion for WoW called Cataclysm, Star Wars: The Old Republic from Bioware may have the best shot of any upcoming MMO to unseat the Warcraft powerhouse.